Here at Waltons, we want to take away the stress of home improvements. That’s why we offer a huge range of garden log cabins under the 2.5m height restriction set by councils, to remove the hassle of applying for planning permissions. All of our log cabins can be fitted by our fantastic, expert installation team, so no matter the project, we are on hand to help. To make sure you get the best log cabin for your garden, check out the 'Ultimate guide to buying a log cabin'. The Noble makes the perfect addition to the garden for those looking for a spacious and stylish building to spend time in during the evenings and weekends. A tongue and groove construction promises a robust and durable finish. The Shore Log Cabin offers a large interior space that is perfect for use as a garden getaway or home office. A high quality construction and attractive design means this cabin is guaranteed to look great in the garden. The Douglas 4.2m x 5.7m Garage Log Cabin is a stylish and strong garage which can safely and securely store your car or motorcycle as well as general storage items. The Noble 6m x 5m Log Cabin is the perfect addition to any garden providing space for both work or leisure. This log cabin has a traditional design and is made from high quality materials. The Shore 5m x 4m Log Cabin is a traditional log cabin that has been designed to be a bright and airy place to work and spend time. Large windows feature throughout the building, allowing an abundance of light in. The Camellia 5m x 5m Log Cabin is a perfect garden building combining both style and practicality. This building also features 44mm tongue and groove cladding making it one of the strongest building in this range. This Pool House Log Cabin is a high quality garden building which has a traditional, New England design. This building works perfectly as a games room and offers plenty of room for furniture and a pool table. The Silver 5m x 4m Log Cabin with Veranda offers a bright interior which provides space for a variety of uses. Made from quality materials, this garden building can be used all year round and will last for many years to come. The Silver 5m x 3m Log Cabin features a chalet style design and is made from high quality materials. 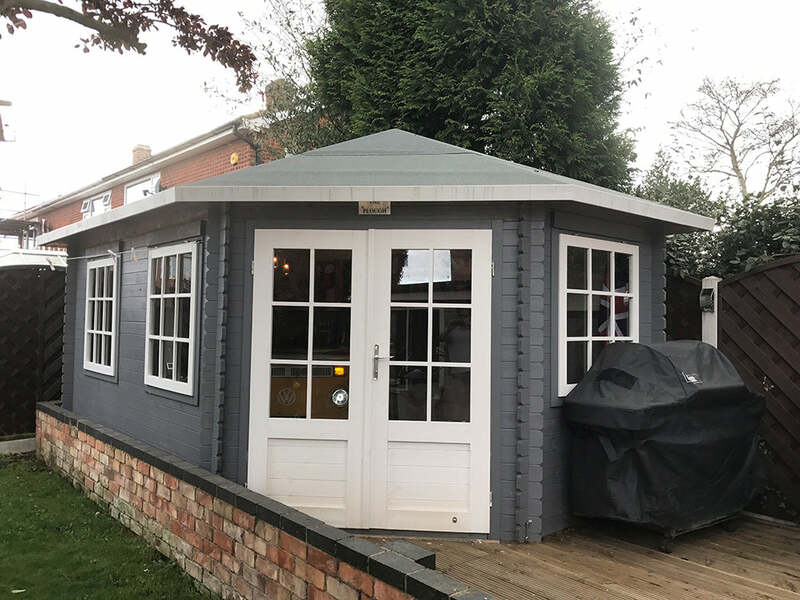 This wooden garden building provides additional living space which makes a great home office, gym, games room or entertaining space. Log cabins got you muddled? Have your heart set on a log cabin, but unsure as to which one will best suit your needs? Check out our helpful buying guide to give you some ideas! Do you want to add space to your home but don't want to go through a long planning permission process? Then take a look at this range of Log Cabins Under 2.5m. All the buildings in this category do not require any planning permission as they fall under the required height by law. If you live in special area like Green Belt, a site of Natural Beauty or any other special area you may still require some permission but most areas will be okay. A Cabin is the perfect addition to any home. It will provide you with a great outdoor room which could be used for almost anything. It could be used as a second living room, a garden office, a study space or an entertaining space. Many of our customers have also used these buildings as home gyms or hobby rooms. Our buildings are made with high quality timber which is all FSC Certified. This means all the wood used is sourced from ethical, sustainable forests. The timber we use is Slow Grown Pine; this quality wood is used as it has a dense, durable structure. The timbers which make up this building are tongue and groove shaped. This means they interlock to form the walls, floors and roof of this building. Once interlocked the buildings are supremely strong. All our log cabins are delivered in single timbers and fit together like a puzzle piece. Our products come in all shapes and sizes so you can choose the right building for your home. Our Corner Cabins are perfect for smaller gardens. They fit snugly into any corner saving the lost floor space in your garden. Our Home Office range is perfect if you're looking for a smart office solution. The easy to build structures provide plenty of space for working from home. We provide Free UK Delivery to most postcodes but we do charge for some areas. For more information take a look at our Delivery FAQS.